Today is the 52nd anniversary of the papal encyclical Pacem in Terris (Peace on Earth). In recognition of this day and the document’s importance for our times, we revisit a message delivered by Pax Christi International Co-Presidents Marie Dennis and Bishop Kevin Dowling at the Pacem in Terris 50th anniversary conference in Rome, October 2-4, 2013. During the 50th anniversary year, Pax Christi USA gathered a number of resources on the encyclical and archived them on our “Pacem in Terris at 50” webpage. You can find those resources by clicking here. We bring you warm greetings from Pax Christi members working for peace and reconciliation on five continents and in 60 countries. Like you, we have been deeply inspired in recent weeks by the Holy Father’s powerful leadership of the world toward a nonviolent, diplomatic resolution to the crisis in Syria. His clear opposition to the use of military force touched our members deeply, giving them courage to continue their difficult work in situations where violence threatens to overwhelm. We are honoured to be part of this important celebration on the fiftieth anniversary of Pacem in Terris. When he was Nuncio in Paris in the early 1950s, Archbishop Angelo Roncalli, later Pope John XXIII, expressed a deep appreciation for our movement – for Pax Christi – which was founded as a Catholic movement for reconciliation at the end of the Second World War. In many ways, Pacem in Terris is the Magna Carta of Pax Christi and we strongly affirm its relevance today. Although the bipolar geopolitical context in 1963 was profoundly different from our context in these early decades of the 21st century, Pacem in Terris clearly described the kind of political, social, economic and cultural conditions that could yet generate peace on earth. 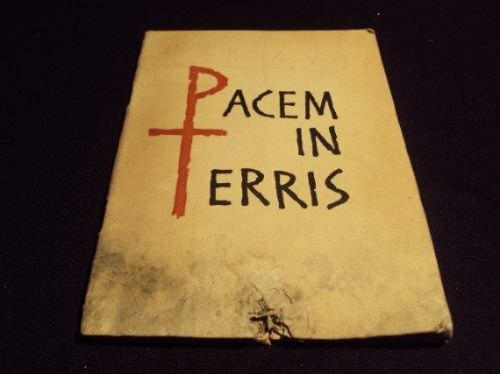 Pacem in Terris was also an optimistic document, stating that “soon no nation will rule over another and none will be subject to an alien power” (para 42). Perhaps that kind of optimism points to the inherent optimism of our Christian tradition – we are Resurrection people, believing that peace on earth is possible – but it was particularly remarkable given that Pope John XXIII had not seen the nonviolent revolutions that would eventually bring down the Berlin Wall and reshape the global political reality. Unfortunately, Pax Christi and others working for peace, social justice and respect for the integrity of creation see now that the optimism of Pacem in Terris was somewhat premature. Many of the “rights and duties” held up by the document as “universal and inviolable” remain in dire need of urgent attention these many years later. And war is hardly a thing of the past. Our local communities are flooded with small arms. Nations continue to produce, store and sell immensely destructive weapons. The recent use of chemical weapons in Syria was horrific evidence of that fact. Nuclear weapons are also an ongoing threat. Although the new START treaty and other agreements have reduced the overall number of nuclear weapons, more countries possess them than did in 1963, not all have ratified the Nuclear Non-Proliferation Treaty and deterrence has become a permanent state of affairs, rather than a strictly conditioned step toward nuclear zero. Furthermore, the possibility of nuclear terrorism is very real, and we are entering into an era of new lethal technologies, including armed drones that are shifting the very concept of battlefield boundaries and undermining international law. For too many people and nations, a major component of the fabric of life is war – preparing for war, struggling to survive in the context of war, and dealing with its consequences. The human and environmental cost of this is enormous: millions of refugees roam the earth. Despite treaties outlawing antipersonnel landmines and cluster bombs, a sea of these weapons still makes many communities uninhabitable. The psychological trauma resulting from war is destroying families and communities. The environmental impact of war is tremendous. And the economic cost is a huge burden on the backs of the poor. Clearly, on this anniversary of Pacem in Terris, there is a great challenge of peace yet confronting the human community. In the past 50 years Catholic thinking about war and peace has evolved in significant ways, increasingly emphasizing nonviolence. We believe that the recent, powerful statements and global witness of Pope Francis are urging us to build on this movement, to develop and articulate an ethic and a theology of nonviolence and sustainable peace. And the Syrian crisis is teaching us that practical, effective nonviolent strategies and instruments must be developed as alternatives to military action if the international community is going to take seriously our responsibility to protect in situations of horrific violence. To embrace nonviolence as a global ethic will require a very long term commitment, a rebuilding of the foundation on which international relationships are built. Rather than defining security in terms of higher walls and stronger fighting forces – rather than orchestrating fear – we will have to develop the concept of security in terms of community, access to food, water, decent jobs, education, health care, re-creation… for all people everywhere, as Pope John XXIII so eloquently did in Pacem in Terris. We will have to embrace this concept of human security – or better yet, human and earth security – rather than national security; invest our resources in and learn to use tools to transform or resolve conflict; support peace education; commit ourselves to inter-religious and cross-cultural cooperation; find ways to take the profit out of war and production for war; and forego the use of military action to defend economic interests or access natural resources. Pax Christi is advocating for the integration of peace building and violence prevention as core elements in the post Millennium Development Goals framework. We also believe it is time for Catholic moral theologians and people of faith to stop referring to the ethical criteria designed to limit war as the “just war theory.” The expression itself, “just war theory”, seems to suggest that war can be readily justified, rather than that war is virtually indefensible in our times. 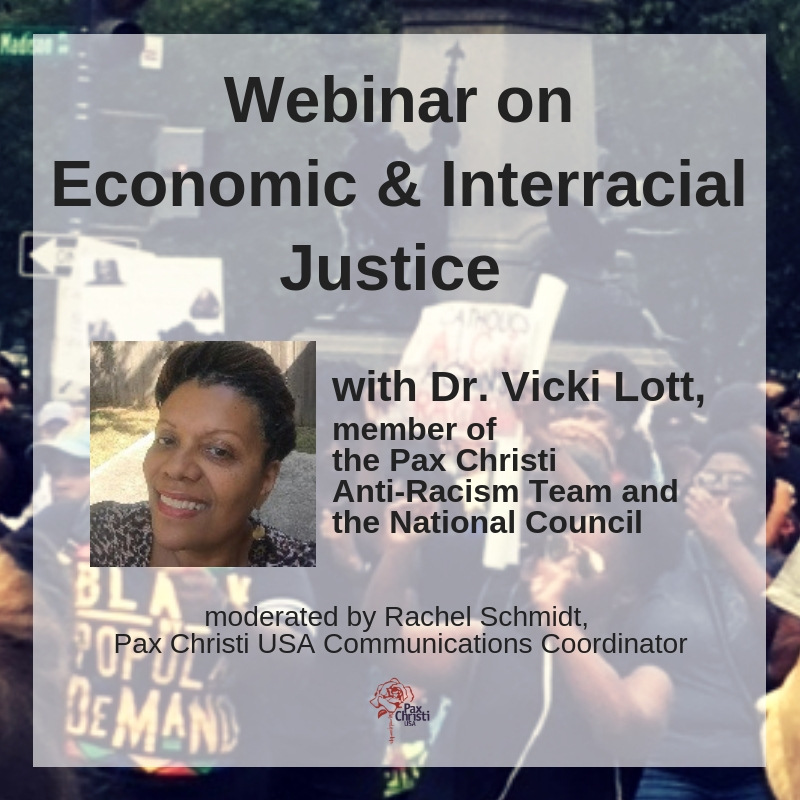 Pax Christi envisions a Catholic Church universally committed to sustainable and just peace and promoting nonviolence in a world where destructive violence perpetuates poverty and threatens ecological sustainability. May we have the courage and prophetic imagination necessary to make that possibility real. As Pax Christi, the international Catholic peace movement, we are very grateful for the work of the Pontifical Council for Justice and Peace. We look forward to continuing a practical conversation with the Holy See and with all of you about nonviolence and sustainable peace. And as a global movement for peace we will hold in prayer the intentions of the Holy Father, whose commitment to impoverished people and to peace fill us with hope and renewed courage. Thank you for your beautiful and Catholic/Christian viewpoint. I attended a retreat in Kentucky at a Cistercian Monastery during which I became enlightened by one specific thought from one of the Monks. Since man turned away from God and decided that he can play God our world will never be free of the loss of charity, faith and hope. We can only try. Magna Carta was brought about by the force of arms of free minded men, willing to die for principles. It was dashed by later royalty. Terrorism cannot be defeated without brave men and women willing to draw lines to the cruelty and violence. Free minded people will always have to stand up to tyranny lest we all end up in a modern day coliseum being ravaged by ” other” believers. Maybe it’s time for a resurrection of the Knights Templar. Oh but they were destroyed by politics and greed and yes the Catholic Church.